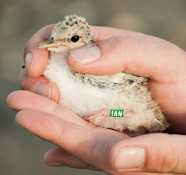 There are 5 Little Tern eggs left to hatch in Kilcoole and 212 chicks of all sizes. It is an excellent time to come and visit the colony as there are fledglings everywhere learning to fly and hunt. We have counted a minimum of 86 fledglings on site which is excellent, we suspect some of the older chicks (Juggernaut and friends) have moved out of the colony to somewhere else along the east coast, or beyond. Many of the chicks are pretty advanced and have darker crowns than their younger cousins. They're still a bit clumsy in the air and haven't mastered the art of diving like their parents. We often see them hunting close to the surface and then bellyflop into the water after a fish without success. However, Little Terns learn quickly and they will be making their way to Africa, for the first time, very soon. The Bray airshow was on recently with many of the planes practising in the Kilcoole area, it was amazing to see but even the most elaborate aerial displays by the stunt planes were no match for the grace and aerial prowess of the Little Terns! 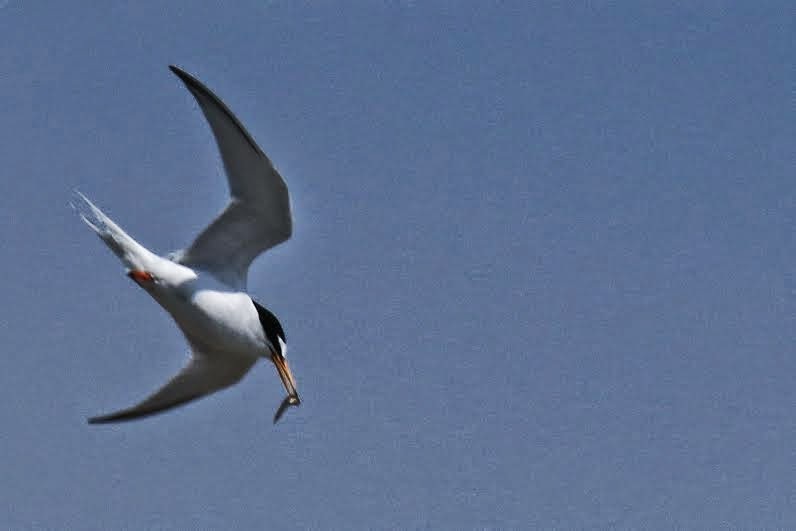 We are delighted with the progress of the terns and so far everything is going according to plan. Touch Wood. It has been very exciting to be involved in a record year and we are extremely grateful to our volunteers for all their hard work and dedication. Since the project began in May we have had an overwhelming response from volunteers and their help has been integral to the successful running of this project. What is incredible is the contrast in our volunteers. We have teenagers fresh from doing the Junior Cert to old age pensioners helping us out on the beach. We also have volunteers that are expert birdwatchers and skilled researchers in wildlife conservation as well as volunteers who are beginners and don't even possess a pair of binoculars. 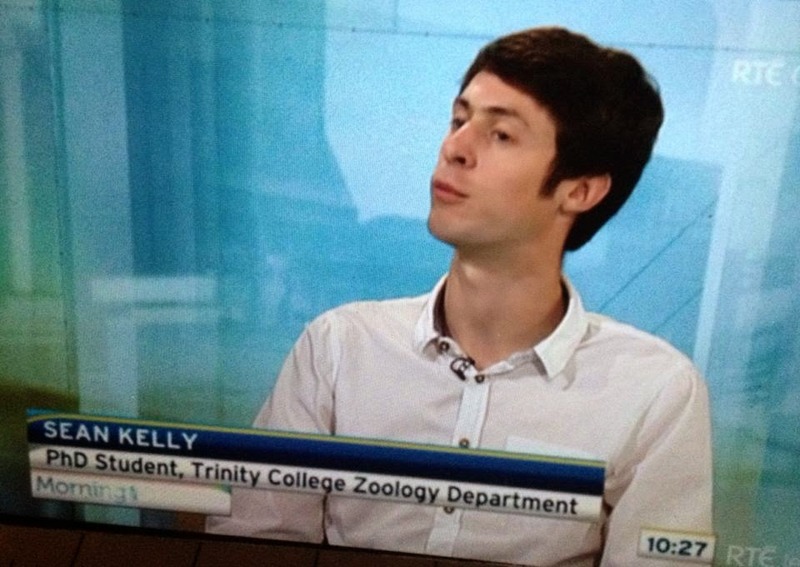 One of our volunteers Seán Kelly is a PhD student in Trinity College Dublin and was recently the centre of media attention after the publication of his paper in the scientific journal PLOS ONE. Seán has spent the last few years looking at bird speciation in Indonesia and his paper classes the Wakatobi Flowerpecker as a full species for the first time! Like all great discoveries this story ended up on the cover of the Metro newspaper, it also appeared in the Irish Times, Independent and countless websites and Seán was interviewed on the radio and television. 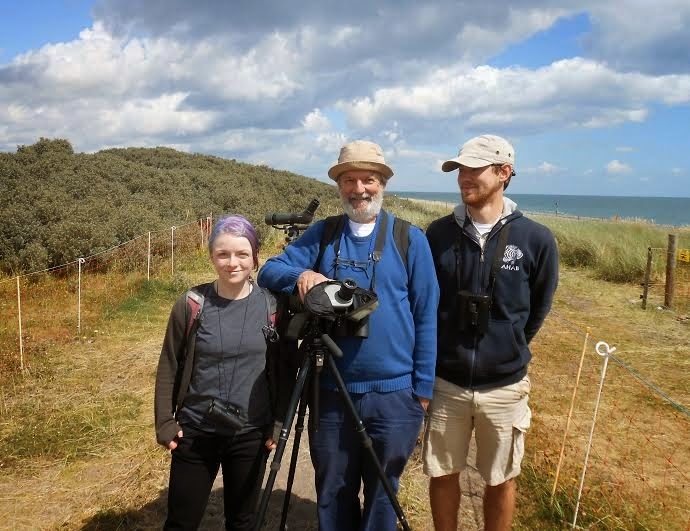 We were all delighted at how well Seán's work has been received and we had more than a few members of the public asking us in Kilcoole about the Wakatobi Flowerpecker. For the full story and a link to the paper check out this article - http://www.headstuff.org/2014/06/reclassification-bird-species-matters-introducing-wakatobi-flowerpecker/wakatobi-flowerpecker-nlb/. Another volunteer, Des Higgins, was also in the limelight recently as he was named as one of the most "influential names in science" and in the world's top 3,000 researchers for his work on the Bioinformatics tool Clustal. Find out more here - http://www.ucd.ie/news/2014/07JUL14/020714-Two-UCD-researchers-among-most-influential-names-in-science-according-to-Thomson-Reuters.html. Des had to get a taxi down when he volunteered last time as he thought we would be late, dedication! 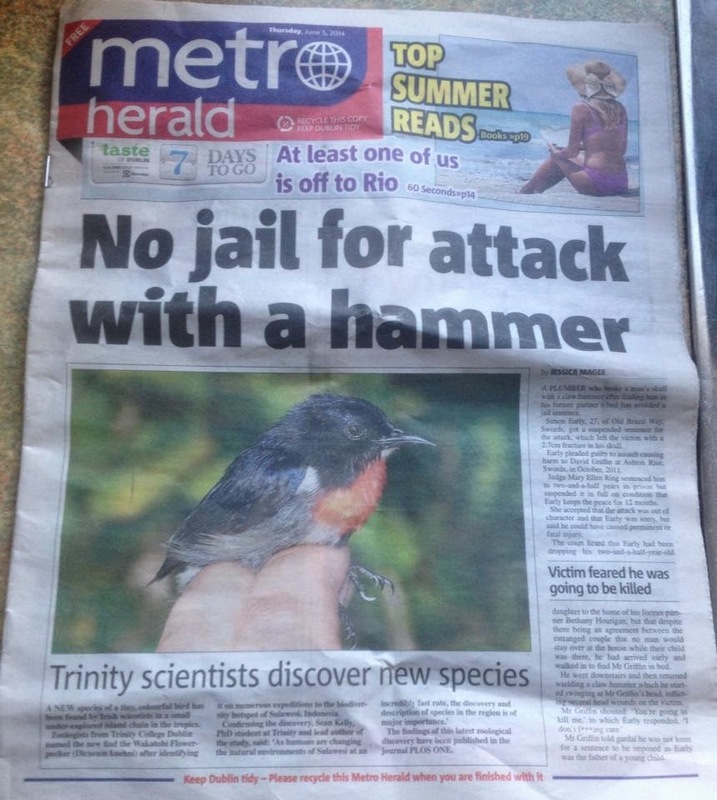 Ignore the jail and hammer headline! Volunteer Seán Kelly looking very smart! Many of our volunteers are students in Tralee, Cork and Dublin etc. who are trying to put their summer to good use and we also have volunteers from a wide range of occupations who squeeze in some hours at weekends or after work. Some people go to great lengths to get here spending hours on public transportation and walking to get here and occasionally helping out in horrid weather (we don't expect this from everyone!). There has also been a multicultural array of volunteers this year with people from France, Lithuania, Peru and Poland (to name but a few) helping us out! All of our volunteers do share one thing in common and that is they have all helped in the conservation of a beautiful and endangered bird as it does not matter who you are or how qualified you are you can still play an important role in this project. Regardless if someone has helped out for an hour or for a whole season we are extremely grateful and we would find it very difficult without the help! We are also particularly grateful to the volunteers that donate chocolate to the project. Last week I carefully left a KitKat chunky in the Buckthorn so I could run off and do something else. When I returned it was gone, I was convinced it had been stolen until I caught a glimpse of the shiny foil of the packaging in the corner of my eye. A rat had taken my KitKat and devoured it, devastation and surely one of the biggest losses of the year in Kilcoole. After hearing my tale of woe a volunteer generously donated some chocolate to the project. So there you have it, volunteers, what a great bunch they are. Thank you. P.S Our e-mail account littletern@birdwatchireland.ie stopped working recently, we are trying to fix it. Apologies for any inconvenience caused, you can e-mail me at powera2@tcd.ie.